Minimal-change disease (MCD) counts for 10 to 15% of cases of primary nephrotic syndrome in adults. Few series have examined this disease in adults. A retrospective review was performed of 95 adults who had MCD and were seen at a single referral center. Examined were presenting features, response to daily versus alternate-day steroids, response to second-line agents, relapse patterns, complications of the disease and therapy, presence of acute renal failure (ARF), and outcome data. Sixty-five patients received daily and 23 received alternate-day steroids initially. There were no differences in remissions, time to remission, relapse rate, or time to relapse between daily- and alternate-day–treated patients. More than one quarter of patients were steroid resistant. At least one relapse occurred in 73% of patients; 28% were frequently relapsing. A significant proportion of frequently relapsing patients became steroid dependent. Second-line agents were used for steroid dependence, steroid resistance, or frequent relapses. No single agent proved superior. There were more remissions with second-line agents in steroid-dependent patients compared with steroid-resistant patients, and remissions were more likely to be complete in steroid-dependent patients. ARF occurred in 24 patients; they tended to be older and hypertensive with lower serum albumin and more proteinuria than those without ARF. At follow up, patients with an episode of ARF had higher serum creatinine than those without ARF. Four patients progressed to ESRD. These patients were less likely to have responded to steroids and more likely to have FSGS on repeat renal biopsy. In this referral MCD population, response to daily and alternate-day steroids is similar. Second-line agents give greater response in patients who are steroid dependent. ARF occurs in a significant number of adult MCD patients and may leave residual renal dysfunction. Few patients progress to ESRD. Minimal-change disease (MCD) is the most common cause of the nephrotic syndrome (NS) in children. It accounts for 70 to 90% of the NS in children who are younger than 10 yr and 50% in older children. It is also an important cause of primary NS in adults of all ages, accounting for 10 to 15% of cases (1,2). Although there are many data regarding the course, response to treatment, and outcomes in pediatric patients, only a few series have examined these issues in adults (3–8). Relatively less is known about the presentation of MCD in adult patients, response to agents other than steroids, the risk for acute renal failure (ARF), and the long-term outcome. Moreover, most series of adults with MCD have not been in US populations, and it is unknown whether the features and course of the disease are the same in differing parts of the world. We therefore performed a retrospective review of 95 patients who had primary adult-onset MCD and were treated at a single tertiary care center in the past 15 yr. Many of the patients were referred by outside nephrologists for opinions regarding treatment. This review was undertaken to characterize this adult MCD population in terms of clinical presentations, response to daily versus alternate-day steroids, patterns of relapse, and response to second-line therapeutic agents and outcomes. We also examine clinical and histologic features and outcomes of adult MCD patients who experienced an episode of ARF. In addition, complications related to the disease and treatments are evaluated. The clinical records of adults who had biopsy-proven MCD and were followed at Columbia University Medical Center from 1990 to 2005 were retrospectively reviewed. Renal biopsies were processed for light microscopy, immunofluorescence, and electron microscopy. Histologic criteria for MCD included diffuse effacement of podocyte foot processes on electron microscopy, absence of electron-dense deposits or thickening of glomerular basement membranes, negative immunofluorescence staining, and absence of segmental sclerosis. Patients were excluded when they were younger than 18 yr at the time of biopsy or had a biopsy or began treatment before 1990. Demographics, presenting characteristics, response to medical treatments, frequency and timing of relapses, complications, presence of ARF, associated histologic features on renal biopsy, outcome data, and laboratory parameters including serum creatinine (SCr), urinary protein excretion, serum albumin, and cholesterol were recorded. Complete remission (CR) was defined as a daily urine protein excretion of <0.3 g/d, urine protein:creatinine ratio of <0.3, or trace or negative results on repeat urine albumin dipstick; partial remission was defined as ≥50% reduction of proteinuria from baseline. Time to remission is time from initiation of therapy to the first day on which remission is observed. Relapse was defined by increased protein excretion to >3 g/d with 3+ or 4+ results on urine albumin dipstick. Time to relapse was calculated from time that remission was obtained to onset. Frequent relapse was defined as four or more relapses within 1 yr. Steroid resistance was defined as failure to achieve remission despite at least 16 wk of prednisone; steroid dependence was defined as relapse upon tapering steroid therapy or within 4 wk of discontinuing steroids and need for long-term maintenance steroids. Hematuria was defined as more than five red blood cells per high-power field. Hypertension was defined as two sequential systolic BP readings of ≥140 mmHg or two diastolic BP readings >90 mmHg. ARF was defined as a rise in SCr to >50% above baseline. Acute tubular injury on renal biopsy was defined by the presence of tubular simplification, loss of brush border, and enlarged reparative nuclei with nucleoli, with or without mitotic figures. Tubular atrophy, interstitial fibrosis, interstitial edema, interstitial inflammation, and acute tubular injury each were graded semiquantitatively on a scale from 0 to 3+ on the basis of the percentage of cortical area affected (<1, 1 to 25, 26 to 50, and >50%, respectively). Arteriosclerosis and arteriolosclerosis were graded 0 to 3+ (absent, mild, moderate, and severe, respectively) on the basis of the degree of luminal narrowing and vessel wall thickening. Statistical analysis was performed using nonparametric exact statistical methods, as appropriate (the Fisher exact test for categorical variables, Mann-Whitney U test for continuous variables between two groups, and the Kruskal-Wallis test for continuous variables among three or more groups). Analysis of time to remission and time to relapse was done by life-table analysis using the method of Kaplan and Meier. Statistical comparison was done by the log rank test. Values of continuous variables are reported as the means ± SD where appropriate. Statistical significance was assumed at P < 0.05. Between 1990 and 2005, 95 adult patients with MCD were identified and met inclusion criteria. The majority (84%) were referred for a second opinion regarding treatment. Clinical characteristics at presentation are summarized in Table 1. Most patients were white (80.6%) with more women (61%) than men, and mean age was 45.1 ± 1.6 yr. Hypertension was present in 42.9%, and microscopic hematuria was present in 28.9%. Mean serum creatinine was 1.39 ± 0.13 mg/dl, mean GFR (by Modification of Diet in Renal Disease [MDRD]) was 71.7 ± 4.0 ml/min per 1.73 m2, mean serum albumin was 2.21 ± 0.08 g/dl, cholesterol was 420.8 ± 16.0 mg/dl, and urinary protein excretion was 9.93 ± 0.71 g/d. ARF complicated the NS at presentation in 17 (17.8%) patients. Mean duration of follow-up for the cohort as a whole was 132.1 wk (median 139; range 119 to 420). Follow-up was longer in the subset of patients who were frequent relapsers (mean 184.2 wk) and those with ARF (mean 223.1 wk). The majority (92%) of patients received oral corticosteroids as initial treatment (Table 2); 65 patients received daily steroids, and 23 received alternate-day steroids. There were no differences in demographic features, baseline renal function, or protein excretion between treatment groups, although serum albumin levels tended to be lower in those who were treated with alternate-day steroids compared with those who were treated with daily steroids (1.91 ± 0.14 versus 2.31 ± 0.10 g/dl respectively; P = 0.055) at presentation. Mean initial steroid dosage for the daily treatment group was 64.9 ± 1.5 mg/d (approximately 1 mg/kg) tapered gradually over 26.2 ± 3.6 wk. Mean initial steroid dosage in the alternate-day treatment group was 121 ± 2.8 mg tapered over 29.1 ± 4.7 wk (approximately 2 mg/kg every other day for 6 to 8 wk, then decreased by 20 mg at 2-wk intervals until 40 mg every other day, followed by a slower taper based on clinical improvement). Mean duration of treatment was slightly longer in the alternate-day treatment group compared with the daily treatment group, but this was not statistically significant (P = 0.15). Mean cumulative steroid exposure (for the treatment of the first episode) was also not statistically significant between treatment groups (P = 0.10). There were no significant differences in percentages of CR and partial remissions between daily- and alternate-day–treated patients (Table 2). Remission was achieved in 75.8% and 73.9% of those who were treated with daily and alternate-day steroids, respectively. 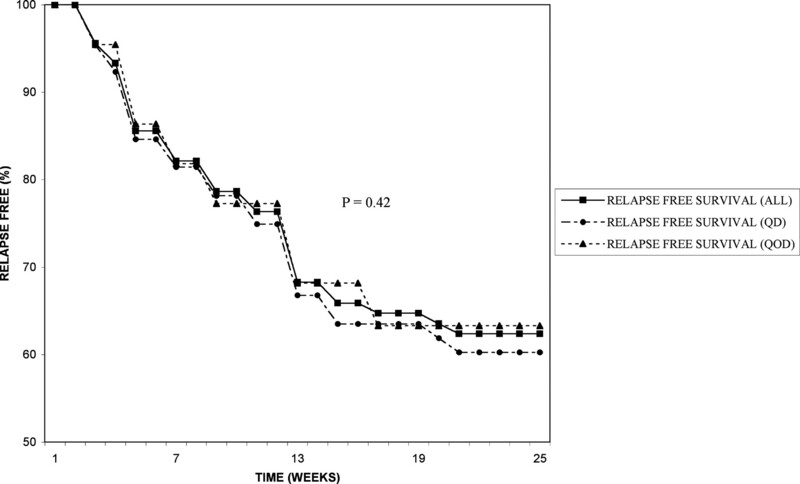 There was also no difference in time to remission between treatment groups (Figure 1). Comparison of time to first remission with daily versus alternate-day steroids. Twenty-four (27%) patients were resistant to an initial trial of steroids. 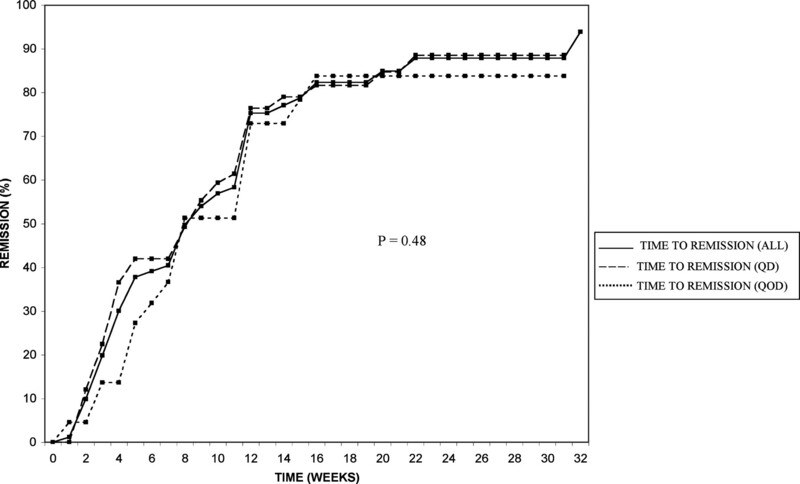 The mean duration of steroid treatment in these patients was 23.42 ± 2.35 wk. There were no features at presentation that predicted response (or lack thereof) to steroids. Responders tended to have a slightly lower serum creatinine at presentation compared with nonresponders, but this was not significant (1.30 ± 0.14 versus 1.61 ± 0.30 mg/dl, respectively; P = 0.066). Many patients received nonspecific therapy in addition to immunosuppression; 63% were treated with blockers of the renin-angiotensin system (38% with angiotensin-converting enzyme inhibitors, 25% with angiotensin receptor blockers), and 56.8% received statin therapy for management of hyperlipidemia. Relapse of the NS occurred in 73.1% of initial responders (Table 2). There were no significant differences in percentage of relapses (75 versus 62.5%; P = 0.77) or median time to relapse (19.4 versus 25.8 wk; P = 0.42) between daily and alternate-day treatment groups, respectively (Figure 2). Approximately 76% of patients were treated with at least one additional course of steroids, and 91.70% achieved a remission (CR 84.40%). Comparison of time to first relapse with daily versus alternate-day steroids. Forty-two (44%) patients experienced more than one relapse. The mean number of relapses was 2.9 ± 0.3 during the follow-up period. Twenty-seven (28.6%) patients met criteria for frequent relapsers with a mean of 4.1 ± 0.5 relapses per patient per year. Frequent relapsers tended to be younger than those who did not relapse frequently (38.6 ± 3.4 versus 46.7 ± 1.8 yr, respectively; P = 0.043). Second-line agents including cyclosporine, cyclophosphamide, mycophenolate mofetil (MMF), and tacrolimus were prescribed for indications that included steroid resistance or dependence, partial response to steroids, frequent relapses, and toxicity or contraindications to steroids. Some received more than one agent (usually sequentially) when they failed to respond, relapsed, or experienced adverse effects from other agents. Table 3 summarizes the response to these second-line agents. It also compares the response in steroid-dependent versus steroid-resistant patients. Twenty patients received cyclophosphamide. For the majority (90%), it was the first of the alternative agents tried. The mean oral dosage was 123.6 mg/d, and mean duration of therapy was 11.5 ± 7.9 wk. Five patients concurrently received an abbreviated course of steroids at initiation of cyclophosphamide. Remission was achieved in 11 (55%) patients. Mean time to remission was 6.4 wk (range 5 to 12 wk). Steroid-dependent patients had better response rates compared with steroid-resistant patients (80 versus 50%, respectively), but this was not statistically significant. Relapse occurred in seven patients (two steroid resistant, one steroid dependent, two frequent relapsers, and two who had never received steroids). Mean time to relapse was 18 mo (range 6 to 42 mo). Thirty-nine patients were treated with cyclosporine at a mean daily dosage of 220 mg given in divided doses (target trough concentration 150 to 200 ng/ml) for a mean duration of 49.5 ± 14.8 wk. Twelve patients received concomitant low-dosage corticosteroids (5 mg/d or 10 mg every other day) for a mean of 8 wk. Remission was achieved in 24 (61%) patients. Mean time to remission was 5 wk (range 2 to 9 wk). As with cyclophosphamide, there were more total remissions and CR in the steroid-dependent patients compared with steroid-resistant patients, although the difference in response rates was not statistically significant. Ten (41%) patients relapsed after discontinuation of the drug, and they became cyclosporine dependent. Five of these patients had previously been steroid dependent. Four patients were treated with tacrolimus (dosage 2 to 4 mg twice daily; trough concentrations 5 to 10 ng/ml). Two patients received concomitant low-dosage corticosteroids (10 mg every other day). There were three remissions (one CR). Fourteen patients were treated with MMF. Ten had previously received cyclophosphamide and/or cyclosporine and had failed therapy, relapsed, became dependent, or experienced adverse effects. The dosage of MMF was 2 g/d, except in three patients who received 1 g/d. Mean duration of therapy was 36.1 ± 7.9 wk. Ten patients received concomitant low-dosage corticosteroids (5 mg/d or 10 mg every other day). Nine (64%) patients responded to MMF: six (of seven) steroid-dependent patients, two (of three) former partial steroid responders, and one (of four) steroid-resistant patients. Mean time to remission was 20 ± 2.7 wk. No single agent proved superior in achieving remission. However, when response rates for all agents were combined, there were significantly more remissions in steroid-dependent patients compared with steroid-resistant patients (82 versus 43%, respectively; P = 0.01). ARF associated with the NS occurred in 24 patients. In 17 patients, it was concurrent with the initial presentation of MCD, and in seven, it occurred during a relapse. Table 4 compares the clinical characteristics of patients with and without an episode of ARF. Patients with ARF were more likely to be male, older, and hypertensive with lower serum albumin and greater protein excretion than those without ARF. There were no differences in the use of medications, including diuretics, angiotensin-converting enzyme inhibitors, angiotensin receptor blockers, and nonsteroidal anti-inflammatory agents between patients with or without ARF. Mean time to recovery of renal function was 6.4 ± 2.0 wk. Four patients required temporary hemodialysis that ranged from 5 to 24 wk. It was not possible to define treatments that best correlated with recovery of renal function. Renal biopsies that were performed in 22 patients during an episode of ARF were reviewed and characterized. Features of acute tubular injury, evident in 14 biopsies, were mild (grade 1) in nine, moderate (grade 2) in two, and severe (grade 3) in three. Patchy interstitial inflammation, seen in 13 biopsies, was mild in 11, moderate in one, and severe in one; interstitial edema was mild in six biopsies, moderate in two, and severe in one. Mild tubular atrophy and interstitial fibrosis (median score 1) was seen in 13 biopsies. Arteriosclerosis was mild (grade 1) in 13 and moderate (grade 2) in two biopsies. Six biopsies did not have any evidence of acute tubular injury, interstitial edema, or interstitial inflammation. At mean follow up of 223 wk, patients with an episode of ARF had a significantly higher mean serum creatinine compared with those without ARF (2.11 ± 0.44 versus 1.15 ± 0.17 mg/dl; P < 0.001). Renal biopsies were repeated in 11 patients (in addition to those done at the time of ARF) because of difficulties with management or because they followed an “atypical” course. Median time between initial and repeat biopsy was 15 mo (range 11 mo to 6 yr). Six biopsies revealed a diagnosis that was consistent with FSGS. All of these patients had been steroid resistant; four were also resistant to cyclosporine, and two were resistant to both cyclosporine and cyclophosphamide. Careful re-inspection of their initial biopsies did not reveal any features of FSGS; the median number of glomeruli on their initial biopsies was 17 (range 8 to 20) accompanied by moderate (n = 2) or severe (n = 2) tubular atrophy and interstitial fibrosis. One biopsy in a steroid-resistant patient revealed glomerular tip lesion; no features of glomerular tip lesion were identified on the initial biopsy, which contained 18 glomeruli, two of which were globally sclerosed. In four patients whose course was characterized by frequent relapses and steroid dependence, repeat biopsy reconfirmed the diagnosis of MCD in three cases, and one was reclassified as IgM nephropathy. Patients who responded to initial steroid therapy were more likely to have better outcomes at last follow-up (regardless of subsequent treatments or number of relapses) compared with those who did not have any response to steroids. Steroid responders were more likely than steroid nonresponders to be in remission at follow up (62.7 versus 17.4%, respectively; P < 0.001) and less likely to progress to ESRD compared with steroid nonresponders (P = 0.047). At last follow-up, even when those in relapse were included in the analysis, steroid responders had higher serum albumin than steroid nonresponders (3.44 ± 0.11 versus 2.72 ± 0.22, respectively; P = 0.003), lower urinary protein excretion (2.06 ± 0.52 versus 5.85 ± 1.12 g/d, respectively; P < 0.001), and better renal function (SCr 1.20 ± 0.14 versus 2.01 ± 0.43 mg/dl, respectively; P = 0.004). Frequent relapsers were more likely to become steroid dependent than those who did not relapse frequently (P < 0.001); 20 of 27 frequent relapsers became steroid dependent. Six (30%) of the steroid-dependent patients subsequently became resistant to steroids after prolonged therapy. At last follow-up, 17 (63%) of the frequent relapsers were in remission (10 CR). Four patients progressed to ESRD. Time from the initial diagnosis of MCD to ESRD ranged from 120 wk to 6 yr. Three of the patients who progressed to ESRD were black, but no other features at presentation predicted progression. These three patients were steroid resistant from the outset, and their repeat renal biopsies revealed FSGS. The other patient who progressed to ESRD was steroid responsive and frequently relapsing and had two episodes of ARF. She remained dialysis dependent after the second episode (125 wk after initial diagnosis). Complications occurred as a result of the disease and/or therapy. There were four thrombotic events (three deep vein thromboses and one popliteal artery thrombosis). All occurred in the setting of severe hypoalbuminemia (albumin range 0.6 to 1.5 g/dl) and heavy proteinuria (16 to 25 g/d). Infections occurred in seven patients. Four infections occurred in the setting of ARF that required hemodialysis (two had line-related bacteremia while receiving steroids; one had herpes zoster with transverse myelitis while receiving cyclophosphamide and steroids; and one developed a pancreatic abscess). Other infections were pneumonia while on MMF (n = 1), fungemia while on steroids (n = 1), and dental abscess while on steroids (n = 1). Treatment with MMF accounted for most of the gastrointestinal adverse effects, including nausea (n = 2) and diarrhea (n = 2), which improved after dosage reduction. One patient had a major gastrointestinal bleed while receiving anticoagulation for a thrombotic event. The remainder of the complications were related to steroid use, including avascular necrosis of the femoral head (n = 2) proximal myopathy (n = 2), cataracts (n = 1), glaucoma (n = 1), new-onset diabetes (n = 1), and psychiatric disturbances (psychosis n = 1; depression with attempted suicide n = 1). There was no difference in complications between those who were treated with daily and alternate-day steroids. There were no morphologic features of calcineurin inhibitor nephrotoxicity on 20 repeat renal biopsies that were performed on patients (for any indication) who had been treated with cyclosporine or tacrolimus. There were no deaths during the follow-up period. This study is one of the largest single-center studies to investigate the course and response to treatment in adult patients with MCD. The treatment of MCD in adults is challenging for several reasons. First, because so many patients respond to initial therapy and because MCD is believed to have a “benign” course, there are no controlled treatment trials in adults. Data are extrapolated from childhood MCD. Second, the pathogenesis of MCD remains unknown. A variety of immunologic abnormalities that affect both humoral and cell-mediated immunity have been described in affected individuals. T cell activation and resultant cytokine or “permeability factor” mediated injury to the glomerular foot processes has been proposed as a major contributor to disease pathogenesis (9). There is an association of disease onset with viral infections, allergies, malignancy, and numerous medications, but the exact triggers are also unknown. Therefore, our limited understanding of the disease makes it difficult to choose therapy that is directed at the primary pathogenic lesion. A third problem in the treatment of MCD is the variability in response patterns and course of the disease. Some patients respond quickly to steroids and never experience another relapse, whereas others will relapse frequently. Some become steroid dependent, whereas others have no response to steroids or become resistant to steroids later in their course. Although a number of studies have attempted to identify demographic, serologic, or histologic features that correlate with course, it remains difficult to predict which pattern a patient will follow. Thus, the challenge is deciding on the optimal type and duration of therapy and weighing the risks of repeated or prolonged courses of immunosuppression versus the significant risks of recurrent bouts of the NS. The cardinal feature of MCD in children is the abrupt onset of proteinuria with the development of the NS. Whereas hematuria, hypertension, and renal insufficiency are unusual in children, these features can be seen in adult-onset MCD. In our cohort, hypertension was present in 42.9% and hematuria was seen in 28.9%. Similar findings have been reported in other series of adults with MCD. The mean GFR was also diminished at presentation. However, this may reflect the age of our patients, other confounding medical problems, and intravascular volume depletion associated with hypoalbuminemia. Steroids form the cornerstone of first-line therapy in MCD. The overall rate of steroid responsiveness in our cohort approached 75% by 13 wk. Similar rates have been reported in other series of adult-onset MCD (3,4,6) and serve to highlight that adults with MCD respond more slowly to therapy than children, 50% of whom respond within 2 wk and almost all within 8 wk (10,11). However, it is interesting to note that three adult Asian studies reported more prompt and favorable responses to steroids (between 80 and 90% response within 8 wk). Therefore, it is possible that ethnic differences may play a role in steroid responsiveness in adult MCD. Nonetheless, in general, adults with MCD will require longer duration of steroid treatment and are not considered steroid resistant until after 4 mo of therapy. In light of this, the use of alternate-day therapy may have real advantages over daily steroids in terms of toxicity, because there may be less suppression of basal cortisol levels and fewer potential adverse effects, including cosmetic consequences. The effectiveness of alternate-day steroids compared with conventional daily steroids has not been well studied in adult MCD (12). Our data indicate that there is no difference in percentage of remissions, time to remission, and frequency of or interval to subsequent relapses between alternate-day and daily steroids. Therefore, alternate-day steroids may represent a reasonable option for the treatment of MCD. Many patients in our cohort experienced a relapse of the NS; 73% had at least one relapse, 44% had more than one relapse, and 28.6% had frequent relapses. Other series of adult MCD have reported that 30 to 62% experience a single relapse and up to 39% have frequent relapses (6,8). Childhood MCD is characterized by somewhat higher relapse rates: up to 76% have a single relapse, and up to 44% have multiple relapses (13,14). It would be useful to be able to predict at the outset which patients will relapse frequently, because this potentially could help guide therapeutic decision making. In childhood MCD, age of onset is related to frequency of relapses, with younger patients showing a tendency toward more relapses. The data are conflicting in adults (4,7). In our cohort, patients who were younger than 40 yr were more likely to be frequent relapsers compared with those who were older than 40 yr, a finding that was also reported in another study (6). However, others have not shown age-related differences in relapse rates (8). It also was previously reported that earlier induction of remission after steroid therapy may be related to earlier relapse in adult patients with MCD (3,4,15), but we did not find a correlation between time to remission and time to first relapse. Many of our patients posed a therapeutic challenge because of steroid resistance, steroid dependence, and frequent relapses. Several treatment protocols are in use for such patients and are based on extrapolation from successful approaches in childhood MCD (16). However, there are limited data on their effectiveness in adults with steroid-dependent or steroid-resistant MCD. Cyclophosphamide has been reported to induce and maintain remission in 25 to 60% of patients for up to 5 yr (3) but seems to be less beneficial in steroid-resistant cases (4,17,18). Cyclosporine has been reported to induce remission in approximately 60% of patients (19–21), but lower percentages are also reported in steroid-resistant cases (22). Although cyclosporine seems to achieve a more rapid remission than cyclophosphamide, between 60 and 90% of patients relapse after the medication is discontinued, making cyclosporine dependence a major problem (23). Furthermore, both cyclosporine and cyclophosphamide have significant adverse effects with prolonged and recurrent use. In light of this, there is considerable interest in finding alternative, less toxic therapy. MMF has attracted much attention in this regard. MMF has been successfully used in the management of many primary glomerulopathies (24), but there are limited data on the effectiveness of MMF in MCD (25–28). Experience with tacrolimus for MCD is also very limited. Potential advantages of tacrolimus over cyclosporine include minimal cosmetic adverse effects and a modestly reduced risk for hypertension and dyslipidemia. The variable use of several second-line agents in our cohort of patients with dissimilar dosages and duration precludes meaningful comparisons of the exact response to these agents and prevention of relapses. Nevertheless, it does seem that response to these agents may be predicted from response to corticosteroids. There was a trend toward more remissions with second-line agents in steroid-dependent patients compared with steroid-resistant patients. Moreover, remissions were more likely to be complete rather than partial in steroid-dependent patients, particularly with cyclosporine and MMF. Therefore, our results suggest that agents such as MMF and perhaps tacrolimus might represent reasonable alternatives for treating frequently relapsing and steroid-dependent patients. Adequately powered and well-designed, randomized, controlled trials are needed to compare the effectiveness and safety of MMF and tacrolimus with steroids, cyclosporine, and cyclophosphamide in adults with MCD and determine which patients are more likely to respond. In some cases, repeat renal biopsies provided insight into why some patients with MCD failed to respond to steroids or other immunosuppressants. Seven steroid-resistant patients in our cohort underwent a repeat biopsy, and FSGS was identified in six cases. Three of these patients subsequently progressed to ESRD. The relationship between MCD and FSGS is controversial. It is unclear whether the histologic diagnosis of FSGS is missed on the initial biopsy as a result of the focal nature of the lesions or there is progression to FSGS, perhaps related to prolonged periods of heavy proteinuria. Nevertheless, it is important to consider this alternative diagnosis in patients who have MCD and fail to respond “predictably” to treatment or have an atypical course. ARF in the setting of MCD has been well documented in the literature (29–31), and it occurred in one quarter of our patients. The pathophysiologic basis of ARF in this setting is not understood, but proposed mechanisms include renal interstitial edema (30) and ischemic tubular injury. Indeed, the majority of the renal biopsies that were done on our patients at the time of ARF showed features that were consistent with acute tubular injury with interstitial inflammation and edema. It is possible that proteinuria itself may contribute to the observed tubular and interstitial damage, because there is increasing evidence to suggest that exposure of proximal tubular cells to albumin overload can lead to endoplasmic reticulum stress (32), induction of apoptosis (33), tubular chemokine and cytokine expression, and activation of the complement cascade resulting in inflammation (34–36) and interstitial fibrosis (37). Nevertheless, it is unclear why patients with MCD might be more sensitive to these effects compared with those with other forms of the NS or why it occurs more frequently in adults than in children. Compared with patients without ARF in our cohort, those with ARF did have higher protein excretion and lower serum albumin. They also were older and more likely to be hypertensive at presentation. Thus, these patients may have more underlying arteriolar nephrosclerosis, which could contribute to hypoperfusion and potentially exacerbate the tubular injury that is induced by the proteinuria or other factors. Regardless of the underlying mechanisms of ARF, most reports in the literature support that ARF that accompanies MCD is reversible, with the vast majority achieving complete recovery of renal function. In contrast, our data suggest that there may be incomplete recovery from ARF. Patients with ARF had a statistically significant higher serum creatinine at follow-up compared with those without ARF. However, it is possible that age-related decline in renal function, increased prevalence of hypertension, use of calcineurin inhibitors in some, and perhaps other comorbidities may be confounding issues. Important concerns in MCD include complications related to both the disease and the treatment, in particular thromboembolic events and infections. The risk for thromboembolism is increased in MCD as in all patients with the NS (38). Four patients in our cohort experienced a thrombotic event in the setting of severe hypoalbuminemia and heavy proteinuria. The prothrombotic state probably arises from a variety of abnormalities, including increased plasma viscosity, low plasminogen, and low antithrombin III. Administration of steroids may also increase the risk for thromboembolism. Increased susceptibility to infection may be related to accumulation of edema and ascites (fluids that potentially serve as media for bacterial growth), urinary losses of Ig, impaired ability to generate specific antibodies (39,40), and decreased serum levels of the alternative complement factor B (41) and hemolytic factor D. Use of immunosuppressive medications during relapses potentiates this risk. In addition, ARF during the course of the NS seems to increase the risk for infection, because five of the seven reported infections occurred in the setting of ARF. This is likely due to the interplay of uremia, hypoalbuminemia, and immunosuppressant medications. Therefore, these patients warrant increased vigilance for infectious complications. There have been many attempts to predict the long-term outcome in patients with MCD. One study reported that adult patients who showed even a partial response to steroids had good renal function over the long term, whereas 16 of 44 patients with no response to steroids had progressed to renal failure within 3 yr (42). Our study confirms the importance of steroid responsiveness with regard to more favorable outcomes. Steroid nonresponders had a statistically significant higher serum creatinine at follow-up compared with responders, and three of the four patients who progressed to ESRD were steroid nonresponders. We recognize several limitations of this study. This is retrospective and nonrandomized and is largely a referral-based population. Therefore, it may not be representative of all adult patients with MCD. However, even at a center that processes >2800 biopsies annually, only 95 adults who had MCD on biopsy and fit our criteria were seen during a 15-yr period. Therefore, it would be very difficult to collect the data in a similar population in another manner. Although nonuniform use of immunosuppressive agents makes it difficult to draw conclusions regarding the effectiveness of certain individual medications in achieving remissions and preventing relapses, this study does allow broad conclusions about steroid-dependent and steroid-resistant patients with MCD. Moreover, this single-center study does define a large population of adults with MCD and suggests the need for controlled clinical trials even in this so-called “benign” disease. This study was supported in part by the Glomerular Center at Columbia University and Zo's Fund for Life.